QuickSpin is inviting you to step into the ring and fight like a Gladiator with their November 2018 release. In fact, the action of this game takes place in a coliseum where you’ll take on the role of a legionnaire, and you’ll battle fierce tigers to reap the glory. But more importantly, the rewards that come with it that could see you win as much as 12,000x your bet. Tiger’s Glory is a high volatility slot. It has 4096 ways to win and stunning graphics that helps to deliver a realistic story to those who’ll dare to try it. What’s more is that this game also has excellent bonus features that we’ve described into more details below. Suitable for: Daredevils and High Rollers. 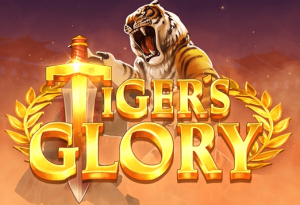 The main bonus feature of Tiger’s Glory Video Slot is the Free Spins bonus. To activate it you’ll need a minimum of 3 bonus symbols to land in view, and you’ll play 7 Free Rounds. Also, it’s worth knowing that if you happen to get 4, 5 or 6 bonus symbols, you’ll play 10, 15 and 20 Free Spins respectively. And the best of all is that you’ll have the chance to win even more Free Spins in the bonus itself. In fact, as you play your Free Spins, you’ll notice that enraged tiger symbols will appear on the reels. And, every time an enraged tiger lands in view, you’ll trigger the battle feature. To sum up, the battle feature of Tiger’s Glory consists of a short symbol animation where you’ll see a gladiator fight a tiger. If the Gladiator wins the fight, the tiger symbol will remain on the reels for the full bonus. Also, you’ll win 1 extra Free Spin. The maximum amount of extra free rounds you can get is 6. Also its worth pointing out, that not all tiger symbols will trigger the enraged feature in this game from Quickspin. But all tiger symbols (red or gold) will pay you, no matter where they land on the reels during the bonus feature. Undoubtedly, savvy casino players will agree with us that it’s not every day that you’ll have the chance to play a 4096 ways to win the game and trigger this many Free Spins. In fact, Tiger’s Glory has the potential to give you a total of 26 Free rounds. And that’s impressive when you think of it especially since the Free Spins comes with sticky symbols. As for most high volatility slots, you can expect fewer small wins but big and mega wins that will get your heart pumping. Step into the ring and be brave as glory awaits! And remember to claim a casino bonus to have more fun! Good luck!